The latest internal migration data shows that an increasing number of inter-state and intra-state population movements are to either sea change/tree change regions or the outskirts of the capital cities. Each year the Australian Bureau of Statistics (ABS) publishes data on internal migration across the regions of Australia. Internal migration data counts the number of residents moving within the state as well as across state borders. 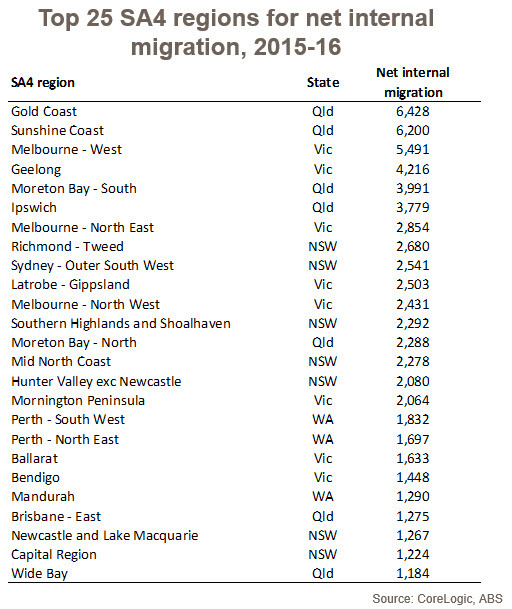 The tables provided within this report show the top and bottom 25 SA4 regions for net internal migration nationally over the 2015-16 financial year. The first table shows that the Gold Coast saw the most net internal arrivals at 6,428 persons over the year. The data series dates back as far as 2006-07 and the net internal arrivals of 6,428 persons is the highest on record and 39.4% higher over the past year. It was also the first time since 2006-07 that the Gold Coast had seen the nation’s highest rate of net internal migration. Of the top 25 regions for net internal migration over the past year, 13 were located outside of the capital cities; generally in areas either adjacent or close to capital cities. These regions were a mix of sea change and tree change type locations. Interestingly, each of these regional markets has recorded an increase in net internal migration over the year. The data supports the strong price rises being recorded across many of Australia’s coastal and hinterland regions, especially those within easy commuting distance of the major capital cities. None of the 12 capital city regions on the top 25 list were inner city areas in which high rise unit development is at unprecedented levels and density is increasing. The capital city areas listed are slanted more towards an increase in greenfield development rather higher density new housing. The second table shows the 25 regions nationally that have recorded the greatest losses from net internal migration over the 2015-16 financial year. Sydney’s Inner South West recorded the largest migration away from the area over the year, losing a net 8,747 residents. It was actually the 10th consecutive year that Inner South West has recorded the largest greatest loss from net internal migration. 17 of the 25 regions listed in the second table were located in a capital city market. The regions listed are generally established areas closer to the city centre. These areas are either seeing greater high density new housing development or very little new housing construction. The non-capital city markets are characterised as regional and linked to either agriculture or the mining and resources sector. Net internal migration to Regional NSW, Melbourne, Regional Vi and Brisbane was the greatest it has been in at least 10 years. Meanwhile, net internal migration to Sydney was the lowest since 2011-12 and it was the lowest in at least 10 years to Regional Qld, Adelaide, Perth and Regional WA. Overall the data indicates that migration is gathering pace in select regions of the country, a number of which are sea change / tree change areas. On the other hand, Sydney is increasingly shedding residents to other parts of the country and this is most likely linked to the high cost of housing. Coastal, regional areas of NSW and Vic along with Melbourne and Brisbane appear to be significant benefactors of the deteriorating housing affordability in Sydney as an increasing number of people leave the city for more affordable locations.